I think it's ok, but dunno, I'm a noob at this. I'm attaching the Express PCB file to this post, the software is free so you can open the file and make corrections if needed. We could ask permission for a PCB run, but if doesn't happen we can print the PCB layout and etch at home. OMG that would be so cool. I don't know if Tom G is even findable but Fonik would know if anyone. I have two EFM pcbs I never even populated yet from when I was on aynthDIY mail list. This would certainly be fun! What format is that for? I have never seen a power header like that. It's the same 16pin euro connector, no? Pin 1 from 3046 through middle of C3 over the top through R6 to C9! Diptrace (free for 300 pins) is the step on from ExpressPCB does gerbers/drill file; forget all the schematic nonsense; launch the layout immediately and after a few hoops it's far quicker than the ol'Express. Ah I see! Corrected. Thanks. I'll try diptrace, I hope it's easy to use as Express PCB. I've ordered a couple of perfboards, gonna try to build it this week or the next and see if it works, I'll keep you guys posted. I found it a bit easier than all the rest. via's are your friend , there are more than a few places where swapping layers would have helped. like avoiding going around/between IC pins. I built this one on perf ages and found the inputs are way too hot. Also if you want to use more than one input at once it needs some changes. If I did it again I would add a summer on the input with less than unity gain. I found the output is a bit low too so if you add a summer you can use a dual opamp and add a gain stage on the output. The filter does sound awesome and moog-a-liscous. It's got fruity tone and a sweet sine self oscillation. Its the same connector that Eurorack uses, but wired up very differently. If you plugged this into a Euro PSU it would short -12V to ground, for a start. Edit: posted before I noticed that an updated, corrected schematic had been posted. I started using diptrace now, thx for the tip! 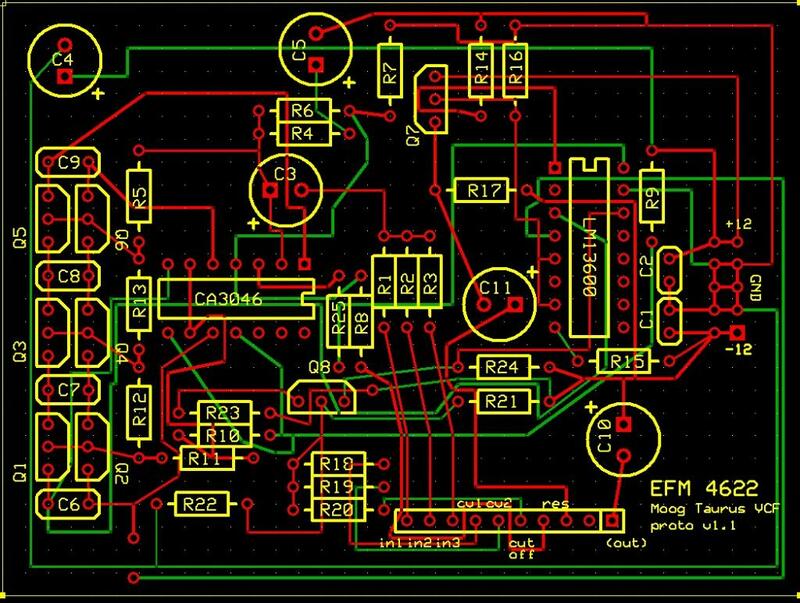 I laid the schematics and followed the components layout found on the pdf file, diptrace autorouted nicely, I only had to make minor adjustments. 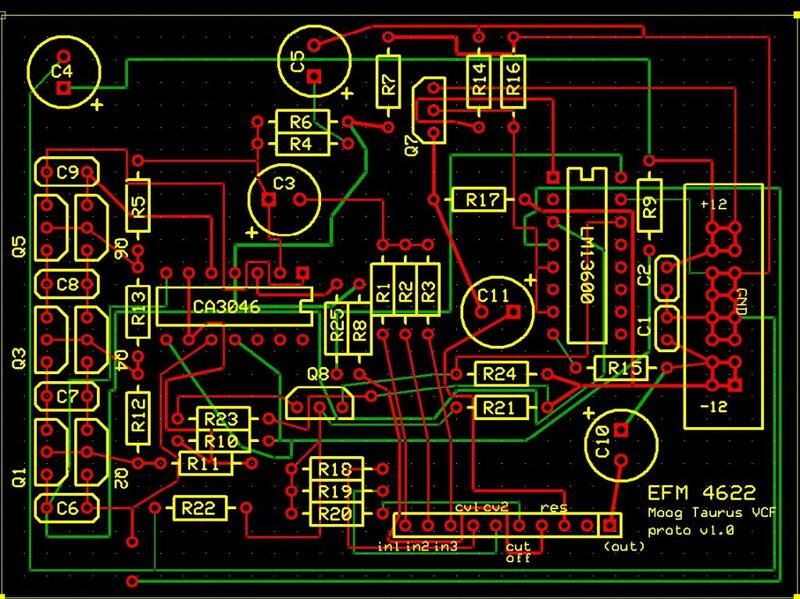 the schematic is most likely correct, while the PCB most likely has errors. so actually no problem, since you roll your own PCB - nevertheless, i lately built an old EFM filter, and found an error on the schematic itself. so breadboard first. 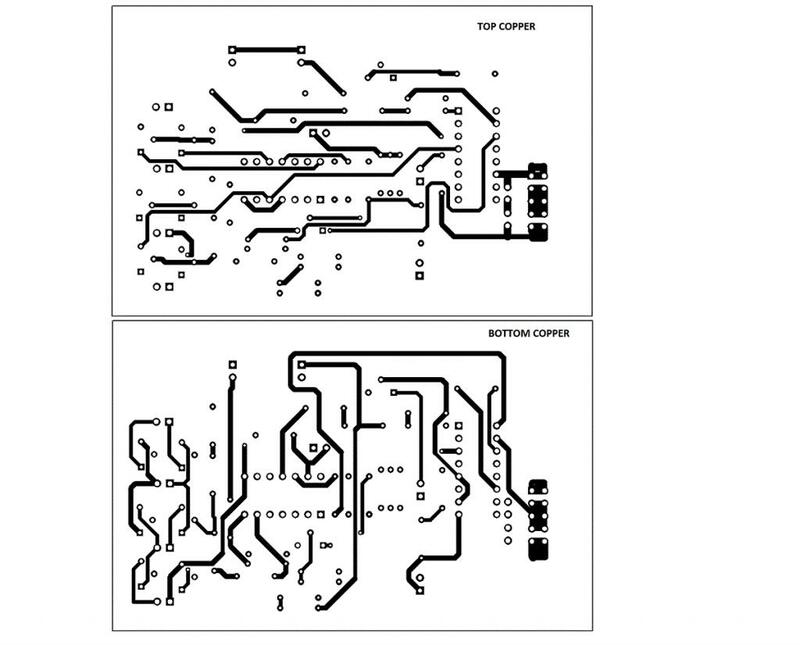 furthermore, while tom gamble did a great job on simplifying designs, his PCB design skills have not been that good. so i would not follow his layout of components positioning, but rather follow the common rules. others could easily add more rules they find important, i bet. I'll keep that in mind. If the filter works as desired, I'm gonna try to widen the traces the maximum I can in the next revision. Maybe Rdunning a broad ground trace all around the PCB? Fonik - Which filter did you build. I have one I haven't built yet as well. I think it is the vxf2e? It is the diode ladder one. Just curious I it is same one you did, then I could pick your brain about the errors. Logicgate - would love to hear audio once you get it working. Maybe Rdunning a broad ground trace all around the PCB? a kind of star configuration is desirable, i think. using an LM13700, this filter did not work at all for me until i connected V+ through a 33k resistor to the current input (pin 1/16). it took me a while to figure this out - audio-traced the input signal all the way to the input of the OTA and was getting nothing at the output. i had always been puzzled by the schematic, because the current input shows only a 470k resistor to ground and there is no positive bias going to the OTA. i'm not sure if this is the right solution or not, but it seems to work for me. i get a decent resonance going but will swap out the ceramics with film caps and see the difference. hope this is useful to somebody. ha! i believe you are absolutely correct. i will put a note on the schematics ASAP. my only other change - i'm going directly into the 10uF cap at the beginning, having shorted the 100k input resistor. i do not know if this makes a difference because nothing happened until i put that positive voltage on pin 1.
other thoughts - if using input lower value input resistors (say 10k? ), it may or may not be useful to put an input summing buffer between multiple audio inputs and the transistor base... i haven't tried this yet, don't plan on having more than 1-2 inputs at most. am also thinking about having opamp-buffered CV. a make-up gain stage may be useful too - while the output is sufficiently usable, there is a volume drop for sure. in the future, i'll build this without the VCA - i'm considering the other half of the OTA for CV controlled resonance. yes, that's one issue with the EFM designs. Tom tried to simplify the circuits as much as possible, and now we try to improve them again and beef them up. "...module A has 1K output impedance and module B has 10K input impedance. So this patch loses almost 10% amplitude..."
you can easily see that 100k input impedance would be better? yes, definitely. i did however see some schematics while browsing around in which the 100k input resistor had been lowered to 10k or skipped completely, input connected straight to the cap.